Why do we keep telling the same stories? Director Jude Christian’s mash-up of Othello and Macbeth, two of the oldest and most retold stories in the dramatic canon, attempts to pose that question. What is it about these tales of jealousy, ambition and violence that keeps us coming back, and what parts of the narrative might we want to tell differently? The condensed double bill hinges on an intriguing premise: the used and abused female characters of the first play take their knowledge with them into the second. So the wronged women of Othello become the avenging witches of Macbeth, wreaking chaos and watching in horror as it follows its bloody course. Violence begets violence. Feminist interrogations of the canon are sorely needed. This experiment, though, is hamstrung by its own concept. 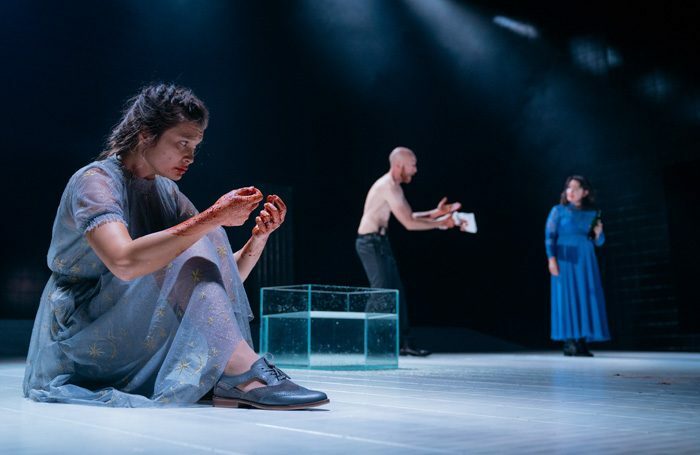 Christian’s cut-down Othello feels like an extended prelude to the moment when the two plays crash together, while the first half’s restriction to a narrow strip at the front of the stage renders it oddly two-dimensional. Designer Basia Binkowska’s eventual big reveal, for all its striking imagery, fails to fully compensate. The production’s treatment of the two texts, meanwhile, falls awkwardly between fidelity and subversion. With the plots mostly intact and mostly separate, the odd moments of splicing strike a discordant note. And although there are some compelling performances – most notably Sandy Grierson as Cassio and Macbeth – the cast often struggle to convey clear meaning from line to line, leaving the bigger ideas mired in confusion.